Prices are those listed by our Ukiah, CA neighbor Caddell & Williams. At your local store, prices may vary significantly, due to transportation costs, state excise taxes, and the pricing structure of the store and of the distributor. 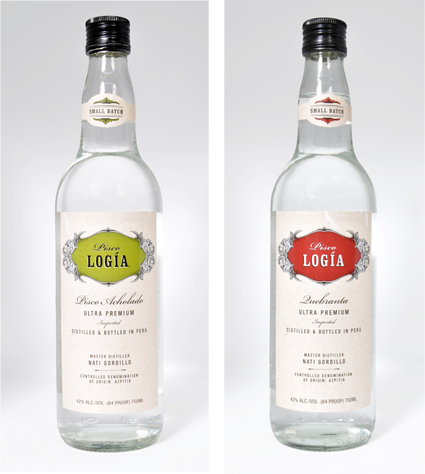 The piscos of Pisco LOGIA are exceptionally pure and well-distilled. Since the distillery is in the vineyards where the grapes are harvested and the wines are made, the flavors and aromatics are as clean and fresh as can be. These piscos make beautiful cocktails. Pisco LOGIA Puro Quebranta. Elegant and intense. Distilled 100% (“puro“) from the non-aromatic Quebranta grape. Non-aromatic varietals have a long history in pisco. Look to the palate instead of the nose to fully appreciate this brandy. $40. 750 ml / 41.8% abv. Pisco LOGIA Acholado. A blend of brandies from the Quebranta and the aromatic Italia grape. Fruity, subtle, and citric, with a hint of muscat. $40. 750ml /41.8% abv.